A very impressive story full of keen observations and a riveting adventure. The Ovum Factor is a fast-paced and enjoyable read, full of all of the promised intrigue and drama. It’s got all the requirements: science, secret societies, explosions, adultery, secret jungle missions, kidnapping, exotic locales ... and you get the picture. It’s fun. Marvin Zimmerman writes in such a way as to get those pages turning fast ... while challenging you to want to know more, more, more ... and he tells you ... he educates you without being preachy. He's such a smooth writer .... classy, elegant, very visual with his words. … His eco-thriller became a love story that became a spiritual journey into the Amazon with phenomenal cliff-hanging chapter endings! The high level of suspense is also something that he managed to sustain throughout the book without lagging at all at any point. ... an excellent work of fiction. A perfect paradigm to the immediacy of the environmental crisis and its precariousness in our current reality. ... packed full of adventure, mystery, conspiracy and an artful connection of events. This book is an easy to read 'page turner' that is very difficult to put down. This “eco-thriller” is the author’s first novel, and he demonstrates a real talent for spinning a page-turning yarn: I read the book in two sittings. Despite the story’s fast pace, though, Zimmerman succeeds in creating a work that a reader may finish quickly, but won’t simply put down afterwards. The ending of the book brought tears to my eyes, and being a novelist myself, pleasantly surprised me. 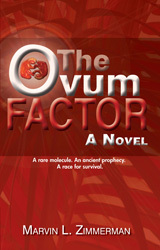 If there is one book that you should give a try, it’s The Ovum Factor. Trust me, you won’t be disappointed.